Today we released a report, China’s Nuclear Arsenal: Status and Evolution, which discusses what is known about China’s current nuclear arsenal, the policies governing its use, and the changes China is making to its nuclear arsenal. I wrote this report using information collected from U.S. government and non-government sources, Chinese-language books and articles, and interviews with Chinese nuclear weapons scientists and defense analysts. China currently possesses a small nuclear arsenal, with an estimated 155 nuclear warheads ready to be deployed on six different types of land-based missiles. Approximately 50 of those missiles can reach the continental United States. The United States, by comparison, currently has more than 1,700 deployed nuclear warheads that can reach China. The evolution of China’s nuclear weapon systems has occurred much more slowly and on a smaller scale than that of the United States and the Soviet Union/Russia. This is consistent with China’s view that the fundamental purpose of its nuclear arsenal is to assure potential adversaries that China can retaliate in response to a nuclear attack, to deter attacks and prevent nuclear coercion. China’s nuclear strategy therefore focuses on how to preserve a credible ability to retaliate, not on detailed requirements for how much damage retaliation should cause to specific targets. China’s defense scientists and engineers play a decisive role in determining China’s nuclear posture. The open source literature published by this community over the past several decades suggests it sees improvements in space and missile defense technology as the most significant and likely challenges to the credibility of China’s ability to retaliate with nuclear weapons. The focus of China’s efforts to upgrade its nuclear arsenal, therefore, is on improving delivery systems to increase their survivability, and not on the design or development of new nuclear warheads. China has halted production of military plutonium but has not declared an official moratorium. Its dedicated military plutonium production facilities have been decommissioned. China’s stocks of military plutonium limit how much it could expand its arsenal without restarting plutonium production. As a result, it cannot engage in a rapid or sudden “sprint” to numerical nuclear parity with the United States and Russia. A massive buildup would take time and the signs—especially resumed production of plutonium for weapons—would be observable. China has conducted 45 nuclear tests. This relatively small number of tests (the United States conducted 1,054 and the Soviet Union/Russia conducted 715) suggests there are a limited number of tested Chinese warhead designs certified for deployment. 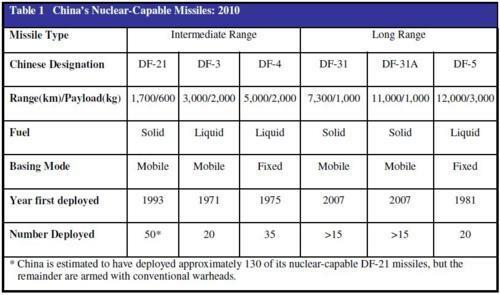 U.S. analyses of China’s test series suggest their smallest tested warhead is still too large for China to place multiple warheads on the long-range mobile missile designed deliver it, the DF-31. China’s lack of nuclear testing since it signed the Comprehensive Nuclear Test Ban Treaty in 1996 restricts its ability to develop and deploy new, smaller warhead designs. As the U.S. and Russia continue to pursue nuclear disarmament, the future of China’s nuclear forces will play an increasingly important role in the calculations of U.S. and Russian negotiators. Some U.S. commentators argue China is engaged in a substantial “nuclear modernization” program and some even assert this portends a Chinese “sprint to parity” with the United States and Russia as the two nuclear superpowers reduce the size of their respective arsenals. But claims that China is rapidly modernizing its nuclear arsenal and seeks numerical parity with the United States are simply inconsistent with reliable data on China’s nuclear arsenal.